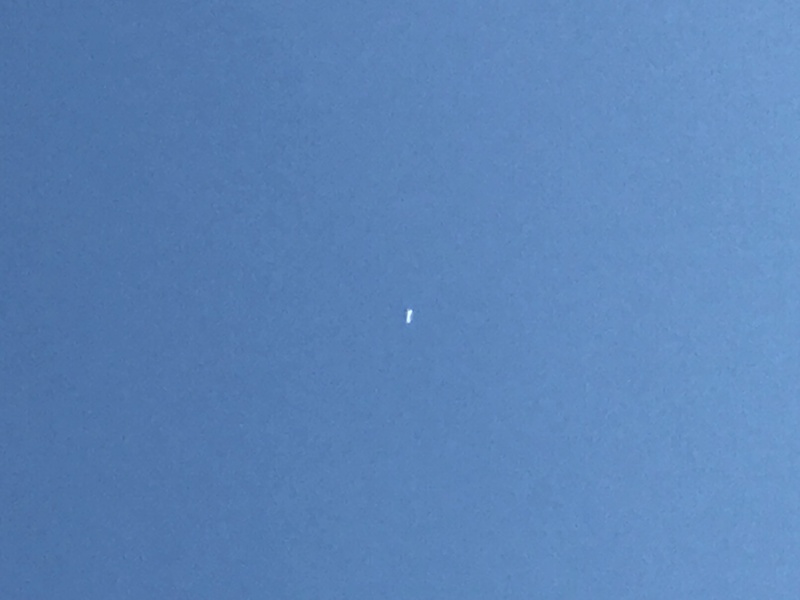 I was looking up at the moon because I hadn’t been able to see it for the past few nights and it looked so pretty so I took a picture of it, then I saw this silver object just gliding I guess, not moving too fast because it was visible for a few min. I was kinda frozen there just looking I don’t know why I didn’t record it, I couldn’t. As I walked away someone from my complex came up to me and asked if I saw that? All I could say was, did you see that?? I then later went to look for him and found him and asked if he got video, but he didn’t and his roommate also saw it. It was gliding at a slow enough speed that we saw it, and it was big, but then disappeared so quick. It was still daylight that we saw it so clear. It was big and oval like a fat cigar. I couldn’t believe what I was looking at. It wasn’t a plane. The photo I’m submitted is just a picture of the moon, the object isn’t in the shot, it was after I took that when I saw it. In daylight. Share your thoughts on this case and more in the comments or on Facebook, Twitter, or Instagram. If you also saw this UFO, report your sighting!